Artist Hilary Gialerakis died aged 79 after a colourful but tempestuous life which she recorded in dairies she began writing in 1924. Shortly before her death in 2003, Gialerakis posted her dairies and memoirs to her daughter Antonia Gialerakis. 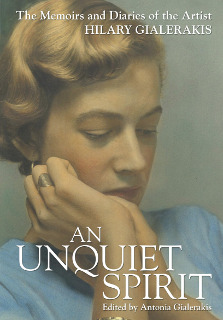 An Unquiet Spirit is the resulting collection of this work which has been edited by Antonia who also provided the book’s foreword. After a lifetime of illness, mystery afflictions and treatment by various doctors, psychiatrists and counsellors, she finally diagnosed herself in the closing pages of the diaries as suffering with no more than “an unquiet spirit”. In reading this work we join her on a stormy and often very funny journey across the years. 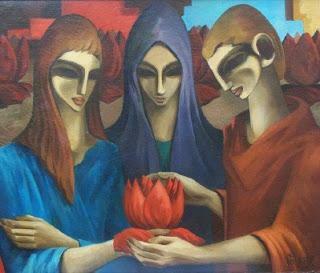 Despite the turbulence of her life Gialerakis, had her work in many exhibitions, under the name of Hilary Lorenzen, in South Africa, where she lived for much of her life. She produced many paintings and received much critical acclaim. The launch of this book coincides with a retrospective exhibition of her work in central London this autumn. An Unquiet Spirit is an often painful testament to the fortitude, daring, and courage of a creative soul, tormented by illness and pain, real or imagined, as she strives to find meaning and purpose in her life. This is a very personal and intimate journey into the mind of an artist and it is at times challenging however, there are many rewards for the reader and this is certainly a story worth telling. Hard Back - 170 pages. Illustrated with colour and black and white photographs of the life and works of the artist. £18.00 from Quartet Books. *Brian Usher is Picture Editor of The-Latest.